Parker's Barkers: A Very Unexpected Sighting! Bill and I went to Kettle Lakes near the Air Force Academy this morning to walk and look for birds. 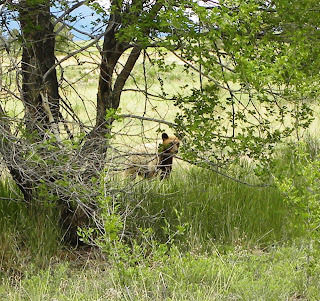 As we got out of the car, we spotted this young cinnamon-colored brown bear about 15 yards away. 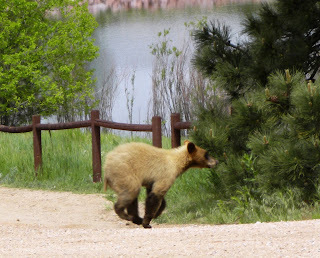 Fortunately, we both had our cameras and got lots of pictures as s/he meandered across the dirt road, into the bushes and then crossed to the other side and down to the lake. 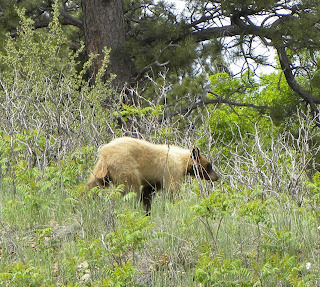 Since this was a young bear, we kept an eye out for mama bear as we shot these pictures. I have never seen a bear in the wild, so this was a real thrill. 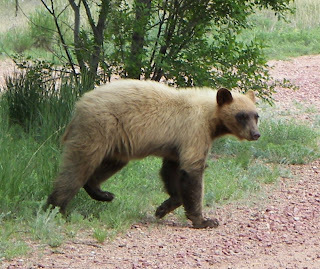 Our son-in-law, Tim tells us the cinnamon-colored brown bears are rarer than the black or brown varieties. I think s/he was waiting to see if we would leave. Since we didn't, s/he scooted across the road. And headed down to swim across the lake and disappear into the woods on the other side. 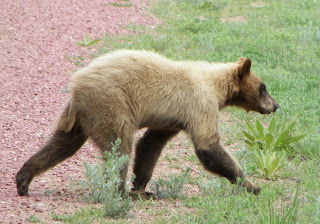 We never did see mama or papa bear and decided this bear was old enough to be on his own. There were several fishermen down by the lake and a family with two small children and two large dogs. I was more nervous with the dogs than I was with the bear. 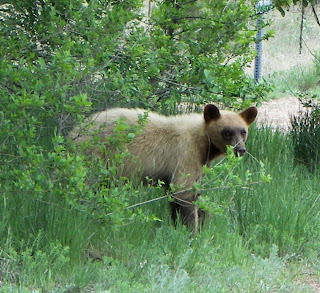 One of the children, who looked to be around 10 years old, had spotted the bear and was hurrying off to find it. Fortunately, he did not. We were pretty excited as we headed off on one of the trails to find some cool birds. 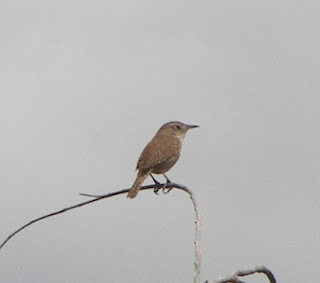 This is a House Wren. I felt like I was back in Florida when we saw this Great Blue Heron down by the lake. 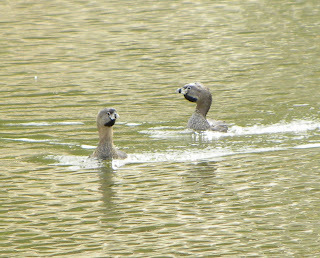 Two Pied-billed Grebe were courting out on the lake. It was fun watching them run across the top of the water. This picture shows their black chins. 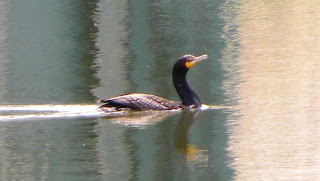 And this picture shows the obvious black ring around its white bill. 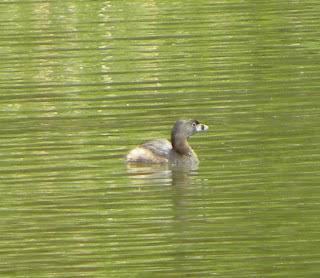 I've never identified a Pied-billed Grebe before but they look so different, I knew right away exactly what they were. 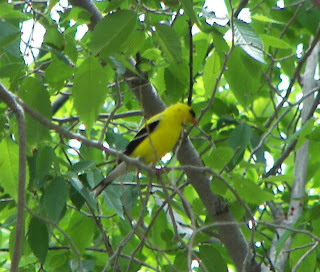 Our friends from Missouri told us the Goldfinches were on their way and we saw our first ones today - first a quick glimpse in the backyard this morning - then several on our walk. 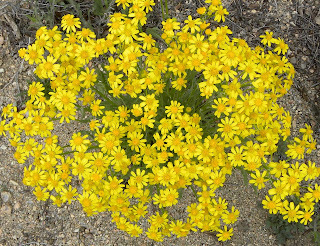 Bill got this shot while I was checking out some wildflowers. According to my new wildflower book, this is Wooly Actinella and blooms June through August. 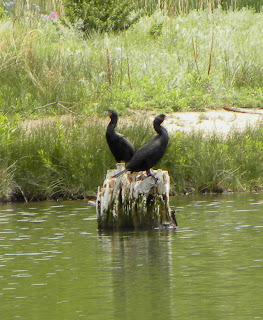 We saw another common Florida bird - Double-crested Cormorants down by one of the smaller lakes. These are quite common along both the east and west coasts. 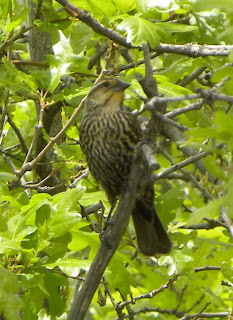 This is a female Red-winged Blackbird. They look entirely different from their male counterparts. All during our walk, Air Force Academy training planes were taking off and landing. This is a glider being pulled by another plane. Now the clouds are rolling in and it's starting to thunder and lightening. I'm glad we took our walk early.